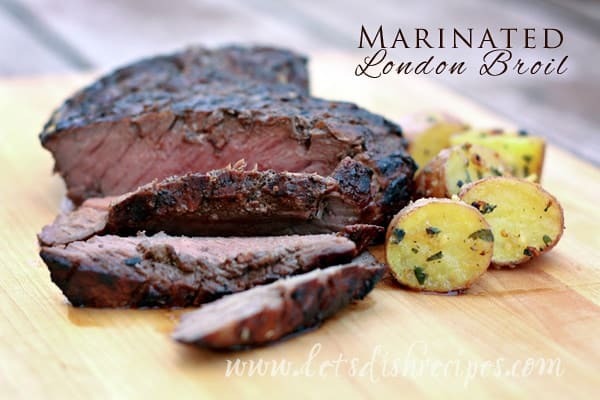 I’ve tried a lot of marinades for flank steak, but this Marinated London Broil is my favorite. It’s a great way to prepare an inexpensive and otherwise tough piece of meat. The longer you marinate your London Broil, the more tender it will be. I definitely recommend overnight if possible. I like to grill mine about 6-8 minutes per side, but your cooking time will vary based on the thickness of your steak and how you like it cooked. Flank steak and London broil are both the same cut of meat. London broil is actually a method of cooking flank steak. Nobody really knows where the name originated, but it probably wasn’t in London, England. You will find either label used in grocery stores. I highly recommend serving this with a side of Parmesan Garlic Roasted Potatoes. Mix ingredients for marinade in shallow pan or zip-top bag. Score meat on both sides in a diamond shaped pattern. Add meat to marinade and cover or seal. Refrigerate for at least 6 hours, or overnight. Remove meat and broil or grill to desired doneness, 10-15 minutes. Let meat rest for 5-10 minutes. Slice thinly across the grain and serve. Who Dished It Up First: A family friend shared this recipe with my mother years ago. i love this marinade! i have all of that in my kitchen! so easy and looks great! This sounds delicious. We’re big red meat eaters so we’re definitely going to have to try this! This is a great marinade! I love to eat London Broil, however when I do I eat it, I eat Grass Fed London Broil. I work with La Cense Beef which is an approved USDA grass fed program. Grass Fed Beef is healthier for you and the flavor is just amazing. In my opinion it far surpasses traditional grain fed beef. The marinate sounds delicious and your meat looks perfectly cooked. Not an easy task. Just as I suspected, the family loved it. Thanks for the recipe. Just thought I would share one of my favourite marinades for top sirloin. Two tablespoons each of vegetable oil, red wine vinegar, soy sauce, balsamic vinegar. One shallot finely chopped, and one clove of garlic minced. Marinate 6-8 hours. Great on the BBQ. 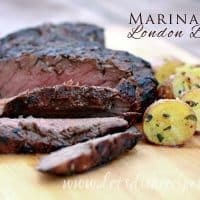 The BEST London Broil ever. I marinaded mine, just under 2 lbs., for about 7 hours. I was pleasantly surprised at how tender it came out! I didn’t have onions or ketchup, so I had to improvise a bit. I substituted ketchup for his best friend/arch-rival mustard, and let me tell you, it was fantastic! Also, I added about double the suggested amount of garlic and some rosemary, which you surely never can go wrong with, and it was soooo delicious. Broiled on high at 4.5 minutes on each side and it came out pretty rare (just right to my taste). Granted my cut weighed in at just under 2 lbs., and the the varying broiler temps and desired pinkness preferences out there, I would adjust accordingly.